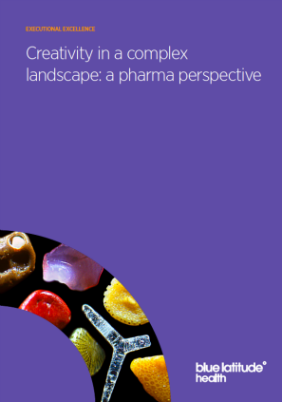 "In pharma, there are a lot of rules and regulations that need to be worked within. You always try to be innovative and push the boundaries, but this mindset is difficult in pharma. Even when you think outside the box of traditional marketing, you have to think inside the larger regulatory box"
While all industries face challenges around developing campaigns that are impactful at global, regional, and local levels, pharma has the added challenge of trying to stay innovative and relevant while still remaining within regulatory bounds. Blue Latitude Health interviewed Mohamed Helal, Marketing Lead for Immunology IBVT at EMEA level for Janssen to understand his point of view on what an exceptional creative campaign when working at the regional level looks like. Working at the EMEA level, you have to take several different markets’ needs into account when developing campaigns and collateral. In your experience, what are some important factors in making work successful at the regional level? Mohamed: We have multiple therapy areas in immunology – dermatology, gastroenterology, and rheumatology – and I primarily work with gastroenterology. Not only are there multiple therapy areas to consider, but also many countries, and anything that is developed at the EMEA level must be relevant to the countries’ needs.The factors that matter most in making creative work successful are quality, timing, and relevance to the markets. Deliverables must be straightforward and easy for countries to adapt for their needs, and they must come at the right time. For example, when developing messaging, it’s important to know what restrictions and barriers might come into play for different countries. Some countries might be allowed to use poster or abstract data in their messaging, while others may only be allowed to use published data. There might be restrictions in some countries around reimbursement within specific populations, while other countries might be able to develop messaging about the wider population. Without taking these factors into account, local country uptake of regional work will suffer. Thinking about how regional work is taken up by individual markets, how does the variance in capabilities at a country level affect the way you approach campaign development? Are there processes or hurdles to take into account? Because of variation between country level regulations, as well as product lifecycle and brand management, some markets will launch later than others, and this will drive the use of content and materials disseminated to them. Leverage markets will receive the regional level tactics and collateral in the rollout phase, as well as best practice and lessons learned by the Co-creation markets from the pilot phase, to guide their own adoption. Coming back to creative work itself – what makes a piece of creative work stand out to you? What are you looking for in a creative campaign? Good question! It’s a tough one to answer. In pharma, there are a lot of rules and regulations that need to be worked within. You always try to be innovative and push the boundaries, but this mindset is difficult in pharma. 3. The campaign can be easily executed on a practical level – it’s straightforward and simple for country level markets to adapt and roll out. Motivation can be a challenge when asking local markets to adopt regional campaigns, so it’s critical to remove barriers to uptake. An example of what I would consider an outstanding creative campaign is the ‘Rewrite Their Stories’ campaign for Crohn’s disease, which was shortlisted for a PM Society award earlier this year. "It got good feedback from physicians who saw it at a congress, who said the campaign was patient-focused, clear, and straightforward. "The core message spoke to a clear unmet need, and this is something that we find resonates strongly with physicians in immunology."